About 2 weeks ago I got a case of apples from bountiful baskets. My husband ate apples, my kids ate apples for almost every meal of the day, I took them in to my daughters preschool class for snack, and we still had tons of apples left. So I began a search for things to do with them. I have never canned and to be honest it kind of scares me a bit. I don’t have any clue what to do so I tried to stay away from canning recipes for fear. I found a great crockpot applesauce recipe over at Cookin’ Canuck. I gave it a try and it was a hit. I am super excited to be able to make homemade applesauce because I know exactly what is in it and I could also control the ingredients which I can’t do with store bought applesauce. It was a huge hit in my house and I especially liked it warm out of the crock pot. Two things that made this even simpler than it already is is having a Apple Peeler. I got this one at Bed Bath and Beyond and of course used a 20% off coupon. It peeled, cored and sliced my apples in no time at all. It was also tons of fun to use and my husband even wanted in on the action. The second thing I swear by is the Reynolds Slow Cooker Liners. They make clean up a breeze and we all know how baked on stuff gets when you use your crock pot. Other than that have fun and make some great applesauce. 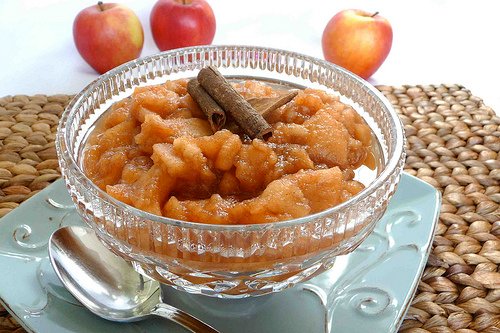 Place all of the apple pieces in your crock pot and stir in sugar and ground cinnamon. Pour water or apple juice over the top of the apples. Cover, turn on low and cook for about 8 hours. Once they are done take a potato masher and break up the apples to the desired consistency. Serve warm or at room temperature. I have a question on the crock-pot applesauce… How do you store it? How long can you store it? Any tips would be great!! Thank you so much for your blog. Just found out about Bountiful Baskets from my best friend yesterday so your pictures and recipes were very timely! I’ll definitely be back again and again! I stored mine in a Tupperware container in the fridge. I am not sure how long you can store it because mine was gone in a week. Glad you like the blog and hope you love Bountiful Baskets as much as my family does.